Parfaits are easiest to assemble and so versatile. You can fill up a huge goblet and call it breakfast or serve in small glasses and pretend it is dessert. Fruit and yogurt based desserts are our favourite anyways. Some light ingredient like popped Amaranth or Fox nut makes parfait so much better if you ask me. That popped Amaranth and Mulberry jam yogurt parfait is a keeper and works well with any fruit preserve but using fresh fruit is always a great idea. Mango and Banana being the best suited for fresh fruit parfaits if you are not using imported berries in India, the season of Mangoes makes things easier for me. 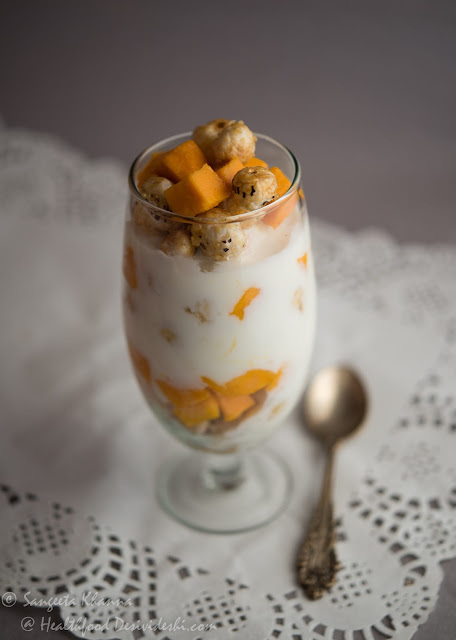 I make this parfait with lightly roasted Poha too, this recipe of Mango granola parfait is another favourite. 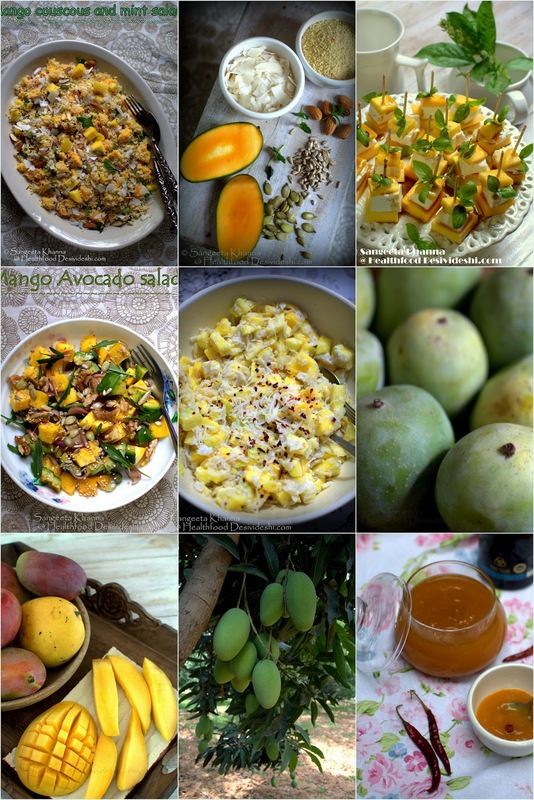 If you love using poha in a bit innovative way you would love this Mango and poha salad that works really well as a breakfast or snack depending or serving size. Mango couscous salad makes a meal if you like mango like we do. The Mango Feta insalata is our recipe when we want to make the meal glamorous. Dahi chooda and aam (Mango) is a favorite summer breakfast of many people back home. We make it with bananas too but whenever I tried Fox nuts (makhana) to replace Chiwda (poha) in the recipe I was very happy with the result. We get nicely roasted Foxnuts made into sattu (instant cereal) in Banaras and when I tried the recipe first with store bought popped Fox nuts I broke them into bits to get the same effect and it tasted great. Recently I tried the parfait with caramelized fox nuts or meethey makhane and this was the best version. The caramelized makhanas soak up the yogurt so nicely you feel like eating a soft light miniature dumpling in the parfait. The result was so good I decided to share it here. You can make the caramelized makhana instantly as this recipe takes about 4-5 minutes. Whip the yogurt with honey or fresh mango puree and keep chilled. Using chilled yogurt makes it instant to eat. Layer the caramelized makhana, mango cubes and yogurt in layers and serve immediately. This parfait will leaves people wanting for more trust me. Fruit based yogurt desserts are the healthiest if you are not drowning them in sugar. You can use a little bit of sugar to sweeten the yogurt if you don't like honey. 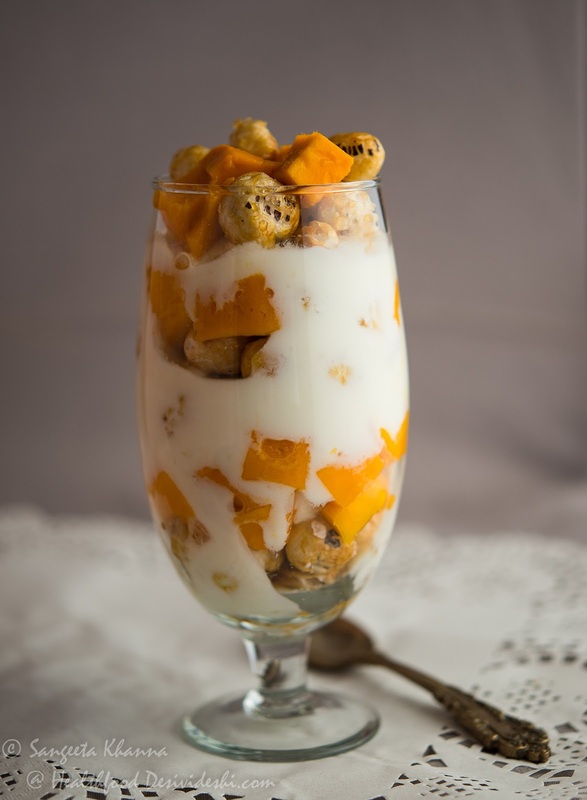 Note that this mango fox nut parfait is suitable for Navratri fasting too.